It was a time for goodbyes this week, for sacrifices and lessons learned. Yet, hopefully it’s not as dreary of an end as one might originally think. It seems every week I bring up a question, and the next week they decide to take time to answer it. Great storytelling, Arslan Senki, you’ve been doing good and we’re now at the final stretch. Last time, we got four new main characters, and I wasn’t quite sure that we really needed to have even more characters introduced when we only have five more episodes left. However, they characters have their use in the story, and this episode especially has made it so that I now remember each of them. Unfortunately, some with more fondness than others. Lucian, who has now taken up many of Narsus’ duties is a good guy I guess, we don’t know much about him, but he’s taken some of the weight off the master tactician’s shoulders so I’m happy he’s there I guess. Tus, who I coined the “Naruto reject” on account of his appearance, seem to be okay as well, but he’s the kind of guy who tries to speak reason to others and yet still gets roped in their stupidity by just trying to keep an eye on them. Arslan may have found his resolve, but he’s now having to deal with a several vassals working with him rather than his simply close and loyal entourage of friends, which makes things a lot more difficult. 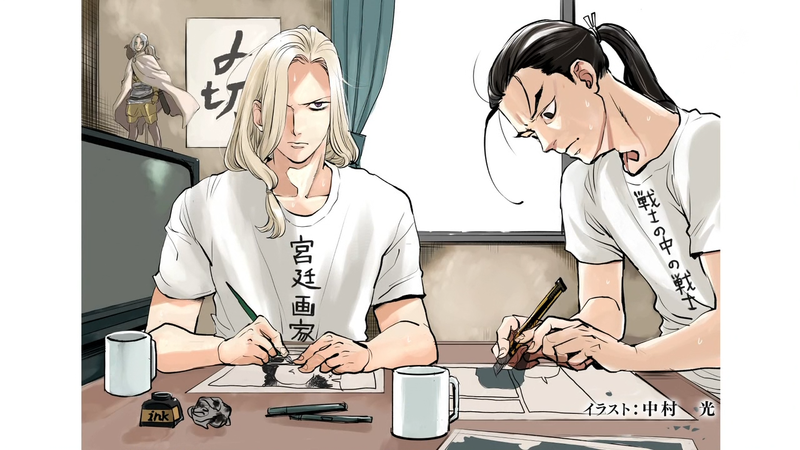 We’re completely fine with Arslan’s company because we know them and we know how loyal they are and that they are all good people who are trying to help him as best they can. We know that each of them will give their lives for him and for each other and they have a close bond that cannot be broken. But to outsiders, especially ones who want to make themselves look good, the prince’s inner circle look to be quite a shifty bunch. Like I said last week, if you really want to get down to it, his entourage is made up of a disgraced captain, his banished best friend, an ex-slave, a thieving con-man, an exiled priestess, a bandit princess, and a traitorous foreign spy. To those who are of noble warrior blood or high class, this would definitely not look like a group that a crown prince should associate with. And especially not a group of people that should have such high standing and position within the army’s ranks, And that fact is causing some dissent among the ranks to the point that it could deal a lethal blow to the army’s morale. And that’s the last thing that Arslan needs right now, especially as he’s about to make his play for taking back his homeland from the enemy. This picture looks incomplete for some reason…I can’t quite put my finger on it. But of course Narsus has a plan, but it’s one that will require sacrifice, and while it had to happen, it makes me sad all the same. As the feature image of course alluded to, that sacrificial pawn is decided to be the most roguish and yet resilient one of the group–Gieve. While Jaswant is the biggest outsider of the group being a complete foreigner, and he’s the one that get’s the most dirty looks, for him to be the scapegoat wouldn’t make as much of an impact. Also, he more than likely knows little about Pars, and wouldn’t do very well traveling alone, whereas Gieve has perfected it. Of all of them, Gieve is the most used to traveling alone and still being able to get the job done. To set this all up, a little play-acting was required from everyone. It was a well acted scene, the conman and thief strikes up a fight between the lords and gets harshly banished by the prince for his actions. I knew that it was all a ploy by Narsus, especially since Arslan is the most forgiving person ever and would never banish any of his entourage unless he absolutely had to, but even still, it was a hard moment to stomach, especially since he’s doing it for the sake of an army that has such annoyingly idiotic characters like Esfan and Zaravant. Yes, I didn’t forget those two newcomers. Zaravant is the blowhard we met last week who decides that he wants to be a racist, angry douche and pick a fight with poor Jaswant every chance he can get and question every order that doesn’t come from either Arslan, Daryun, or Narsus. He’s such a caricature that you can seen where his character is going from a mile away. The only question you might have is whether he’s going to get a tragic comeuppance, or a humbling comeuppance. Considering Arslan’s nature and that he needs all the men he can get for this final fight, you can guess which direction the plot decided to go. Dude, you know who else was raised by wolves? Romulus and Remus. And you don’t see them crying about it! But Esfan…you…you disappointed me. You are a disgrace to your brother’s name, and bring shame to his memory. After the valiance that he displayed in his final moments, you taint them by daring to lay the blame at Gieve’s feet. I understand that your background being raised by wolves gave you a bit of a chip on your shoulder and that you’re grieving the loss of your brother, but that whole farce of a grievance was ridiculous. Shapur was being tortured and was already mortally wounded, he was going to die anyway. All the blame lay on the Lusitanians and that horrid creature Bodin. I think those eyes speak for themselves. On top of that, Shapur asked for one of his countrymen to kill him, to make him a martyr to the cause. And on top of that, Gieve wasn’t the only one who tried, and he was actually rewarded by the queen for what he did. Either you didn’t get the whole story (which isn’t surprising since most of the military at Ecbatana are more than likely dead), or you’re being a childish idiot lost in his grief and just needed someone to blame. Either way, you had better apologize, especially since you were specifically the one who saw that he was the one who saved your hide when you and the blowhard screwed up. –that is, fools who don’t know how to follow orders! In an effort to make themselves look good, two of the three stooges decide to go off script and attack and extremely obvious trap. Tus at least gets the benefit that he went along trying to keep the other two out of trouble, but Esfan and Zaravant really have no excuse and no sympathy whatsoever from me. While Arslan does forgive them for their transgressions in the end, I think he definitely needed to lay down some kind of punishment for their transgressions. Selfish moves like that can cost you your life and that of your companions on the battlefield. Narsus’ best laid plans mean nothing if the chess pieces decided to do their own thing and go against orders. I’m glad that the three did learn a lesson through their own humiliation at having to be rescued by the prince, but if Arslan doesn’t do it, I hope Daryun at least takes them to task. And these men and the soldiers under their command would have all died a vain and needless death if it wasn’t for a capricious “djinn” who decided to come to their rescue. It really speaks to how much Gieve’s character has grown over the length of the series, shown simply by his rather selfless actions this episode. When we first met him, Gieve took the shot to end Shapur’s life, but he expected a reward for it. Everything he did, he equated a monetary value. What could he get out of it? That was the end-all be-all question for the jack-of-all-trades minstrel. However, in this one episode, we see him being unjustly made a scapegoat for the unification of the armed forces, he’s going on a long journey to complete a task Narsus asked of him, and on top of that, he goes and saves a bunch of dolts who hurled hurtful accusations at him and were the main reason he had to go through that whole sham of a banishment in the first place. And not once does he even think about asking for compensation for his actions. Not once does he even hint at asking for a reward for his help. Instead, he does what he does as naturally as he does everything else. He has no problem with it, because now those things are no longer the most important things to him. He’s found something with much more meaning, something better…and he will do whatever is in his power for them. A rogue with a heart of gold. As he insightfully informs those idiots, he and those “outsiders” that Arslan has surrounded himself with, were there for him when no one else was, and they will continue to be there for him until the end. They share a camaraderie that cannot be broken, and so no matter how far he may go, Gieve will always be a part of this unbroken circle of friends and comrades that holds the young prince at its center. In the end, Gieve doesn’t say a final sayonara to Arslan or any of the others, they will see each other again. even if it won’t be for some time. He does have some final words with Farangis before going on his way, and it’s at this moment, when even though he still has his sparkle, the smile behind it is genuine, that is when the lady priestess–the longtime object of his desire–begins to look his way. The smile and warm words that she gives him, speaks of the possibility of taking things further when he does return. And do return soon, Gieve. Farangis won’t be the only one who will miss you. So, where do we go from here? Well, Arslan is now on the warpath literally, as he moves his army towards Ecbatana. Both Hermes and Guiscard are waiting for him, and now that we’re down to the wire, the kid gloves are coming off. Kubard, who I knew we would see again, has decided to seek out Arslan and find out where the other prince stands. Gieve has been sent on a secret mission to help find someone that will help Arslan obtain the throne. Honestly, I have no idea who that could be, so I’m assuming it’s a completely new character we haven’t met yet. Some speculate that he’s looking for Kubard, but I highly doubt it. Narsus doesn’t know the man survived the battle of Atropatene, and the man’s overall strategic value is not all that much different that any other lord under Arslan’s command. No, whoever Gieve has been sent to find, is more important than that, and I can’t wait to see who he digs up that can make such a difference. Arslan and his army are following Narsus’ plan, which has them having to take down a Lusitanian stronghold before they can actually get to the capital. St. Emmanuel’s Keep is under the leadership of a librarian of all things, named Barcacion. Don’t recognize the name? Well, we’ve actually seen him before. He was shown for split second last episode as being the guardian of a very familiar little cross-dressing Lusitanian commander. Guess who we’ll be seeing next episode, in their sixth and fastest reappearance in the series to date? Hint: Arslan might be touched by the light of a French star next week, though whether it kills or heals him, all depends on the circumstances. 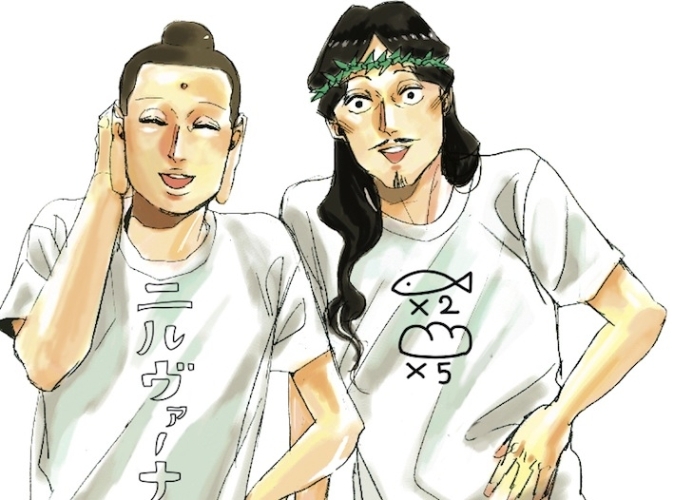 Today’s endcard is by Nakamura Hikaru, mangaka of Saint Young Men (Jesus & Buddha live together as roommates in Tokyo). The endcard itself is a direct parody of Saint Young Men. Note how the apartment setting and white T-shirts match the SYM setting. Has anyone ever read SYM or her previous work, Arakawa Under the Bridge? I can only see Gieve’s separation from the group as temporary. And if I had to guess on who he’s been tasked to find, it would be the same guy Sam tried to win over to Hermes’ side but declined at the thought of a civil war between the two princes. I wouldn’t call all three idiots. The bald guy seemed to be the only one with his head on his shoulders during the march. Just that his choice of action was overruled. Well, like I said at the end, I don’t think Kubard is really the guy that he’s looking for. Narsus has no way of knowing if he’s alive, and he also wouldn’t be of any more or less use than any of the other warlords. I think he’s going after someone completely unknown, but I don’t know who yet. And yeah, the bald guy isn’t really an idiot, but he’s just hanging with the wrong people. Arslan trying to look like Leonidas in the last screencap. There was a small mistranslation in the subs for the episode. Gieve isn’t out looking for someONE, he’s looking for someTHING. So, that’s a little something to chew on.